More than 1,000 letters of objection have been submitted against plans for 2,000-plus homes at the former Wisley Airfield site and now National Air Traffic Services (NATS) has also stepped in. An application to build 2,100 homes on and around the airfield in Ockham, along with a primary school, nursery, health facility and shops, was submitted to Guildford Borough Council in December by Wisley Property Investments (WPI). It provoked strong objections from villagers, who have also made their views clear about the apparent tactics used in a recent telephone survey. The survey, carried out on behalf of WPI by Marketing Means, has been branded ‘a cosmetic sham’ by campaigners Wisley Action Group (WAG). The group claims the survey does not involve residents living in the Wisley and Ockham area, after one caller was recorded saying the survey was for those living within seven miles of Guildford. WAG has taken issue with several aspects of the survey, with Helen Jefferies saying: “They did not ask if the interviewee approves or disapproves of a potential development on the Wisley site, preferring instead to talk about what sort of facilities they’d prefer as part of a new development. Chris Bowden, director at Marketing Means, said: “Marketing Means was commissioned by WPI to conduct a telephone survey of Guildford borough residents in regard to housing and development plans in the area, and in particular to the proposed housing development at Wisley Airfield. “The survey fieldwork has been completed, in which Marketing Means’ interviewers completed just over 1,000 interviews with a representative sample of residents, called on the basis of a random selection of telephone numbers across the borough. “The sample of telephone numbers was deliberately selected so that the total in each of the borough’s wards was in proportion to the number of households in each of those wards. “From the outset, the survey fieldwork therefore covered the entire borough, including Ockham, Wisley and East Horsley. “The DVOR and associated DME at Wisley is part of the NATS En Route infrastructure and the scale and proximity of the proposed development is anticipated to cause an unacceptable degradation to its operation. “While the DVOR/DME is due to be removed from service as part of a nationwide rationalisation, there is currently no firm plan or time frame for the decommissioning of the installation. He wrote that until an alternative was found, NATS must object to the homes. 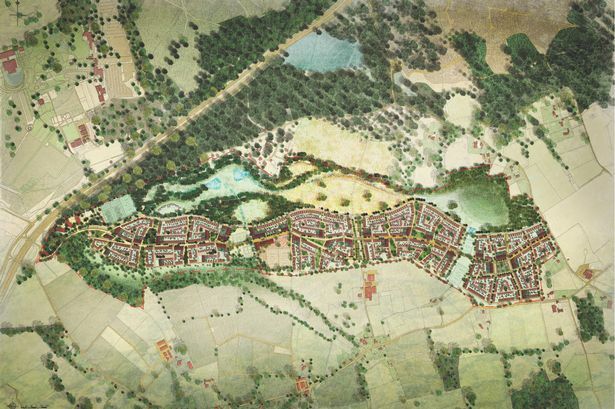 Mike Murray, representing Wisley Property Investments, said: “WPI has submitted proposals for a sustainable new community on the biggest piece of previously developed land in the Guildford green belt at Wisley Airfield. “The 70 acres of previously developed land at the airfield – brownfield land by another name – includes a NATS navigation beacon which is due to come out of service in the next few years as it is replaced by more modern technology.